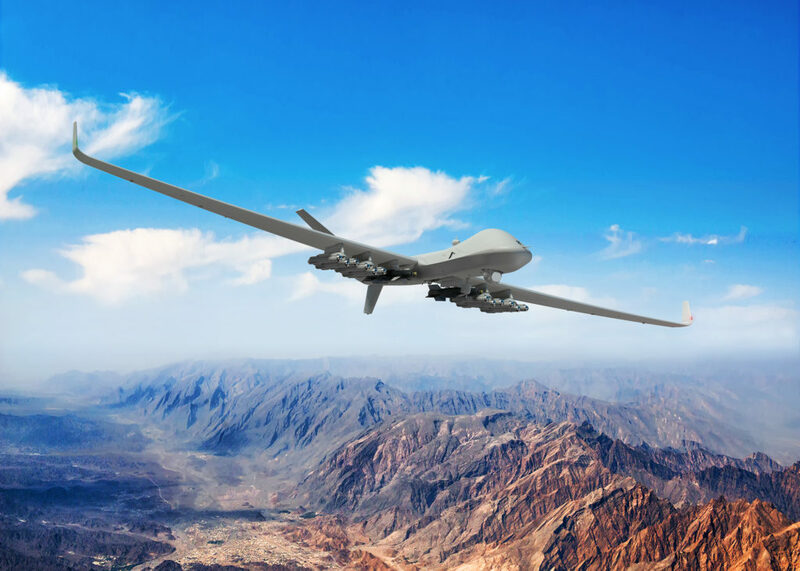 MBDA has received a contract for the integration of its Brimstone high-precision strike missile onto the Royal Air Force’s (RAF) Protector RG Mk1 remotely piloted aircraft developed and manufactured by General Atomics Aeronautical Systems, Inc. (GA-ASI). Brimstone and Protector RG Mk1 will provide key new capabilities to the Royal Air Force’s Intelligence, Surveillance, Target Acquisition, and Reconnaissance (ISTAR) force, enabling them to engage high-speed moving and manoeuvring targets (including maritime fast attack craft for the first time). The Protector RG Mk1 can carry three lightweight Brimstones per weapon station, and so offers a much higher loadout than the Reaper platform it will replace. James Allibone, MBDA’s UK Sales Director, said: «Protector RG Mk1 is the third UK air platform to benefit from the unmatched capabilities of the Brimstone missile, providing UK Armed Forces with vital operational advantages and sovereign defence capabilities. Brimstone is unique in its ability to be carried by platforms in all domains, land, sea and air, providing a common weapon that delivers both operational and cost benefits. Commonality is a key part of all MBDA’s latest systems, and is a major contributor to the £1.7 billion in savings that the partnership approach between the UK MoD and MBDA has generated». Earlier in 2018, the United Kingdom Ministry of Defence (UK MoD) announced a £400 million contract with MBDA for the Capability Sustainment Programme (CSP) of Brimstone missile, to build new missiles and extend this missile’s service life beyond 2030. Brimstone will provide Typhoon with a low collateral, pin-point accurate air-to-surface weapon, further enhancing the aircraft’s already combat-proven swing-role performance. Planning for the next stages of work on Brimstone – including evaluation by the RAF in mid-2018 – is now underway ahead of its entry into service. Andy Flynn, Eurofighter Capability Delivery Director, BAE Systems, said: «To complete this milestone is testament to the expertise and dedication of our people and the value of working closely with our partners. Brimstone will add a low-collateral, high precision strike capability and ensure Typhoon remains fit to meet the threats of the future for decades to come». 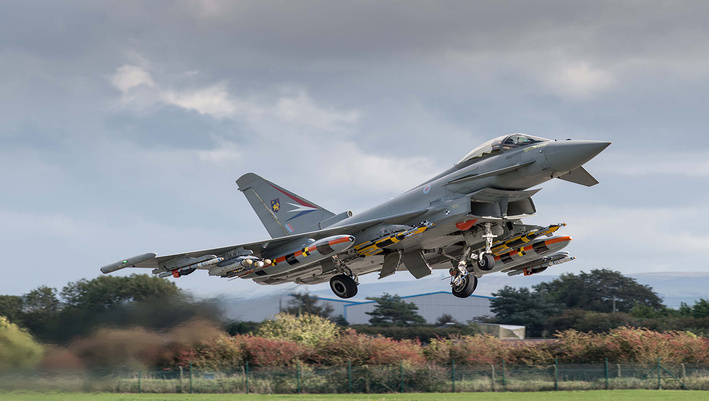 The first live firing of MBDA’s Brimstone air-to-surface missile from a Eurofighter Typhoon has been successfully completed as part of ongoing development work to significantly upgrade the capability of the aircraft. The trial is part of work to integrate the Phase 3 Enhancement (P3E) package for Typhoon, which will also deliver further sensor and mission system upgrades. The P3E package forms part of Project Centurion – the programme to ensure a smooth transition of Tornado GR4 capabilities on to Typhoon for the Royal Air Force. Volker Paltzo, CEO for Eurofighter Jagdflugzeug GmbH, said: «The successful completion of this trial is an important step towards integration of the weapon on to the aircraft. 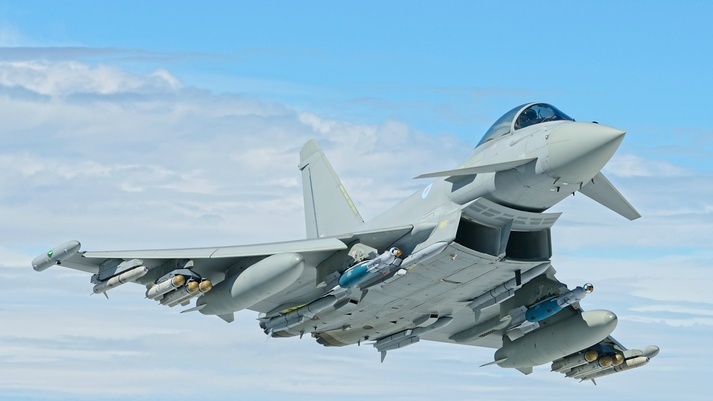 Brimstone will provide the Typhoon pilot with the ability to precisely attack fast-moving targets at range, further enhancing the aircraft’s already highly potent air-to-surface capabilities». Andy Flynn, BAE Systems Eurofighter Capability Delivery Director, added: «Through the dedicated work of our teams, and with support from our partners, we have been able to reach this milestone in a short space of time. We will now continue to work alongside the Royal Air Force and our partner companies in a joint approach to ensure we successfully deliver this package of enhancements into service». Andy Bradford, MBDA Director of Typhoon Integration, said: «This first firing is a major milestone for both the Brimstone and Typhoon programmes. Together Brimstone and Typhoon will provide the Royal Air Force and other Eurofighter nations with a world-beating strike capability to beyond 2040». The successful trial follows completion earlier this year of the flight trials programme for the MBDA Storm Shadow deep strike air-to-surface weapon and the MBDA Meteor ‘beyond visual range’ air-to-air missile. Operational testing and evaluation of those capabilities is currently ongoing with the Royal Air Force ahead of entry into service in 2018. MBDA’s Brimstone precision strike missile is being planned as the UK’s guided missile solution for the Royal Air Force’s (RAF) Protector Remotely Piloted Air System (RPAS) programme. If confirmed, the General Atomics Aeronautical Systems Inc (GA-ASI) Certifiable Predator B will enter service with the British weapon. The integration plan is included as part of the Ministry of Defence’s (MoD) Main Gate selection of the aircraft and, if agreed, the missile will be integrated and fielded in line with the Platform’s introduction to service. MBDA will now work together with UK MoD, U.S. Department of Defense (DoD) and GA-ASI towards a programme which would see the missile undergo integration onto the Air System with trials and firings towards the end of the decade. 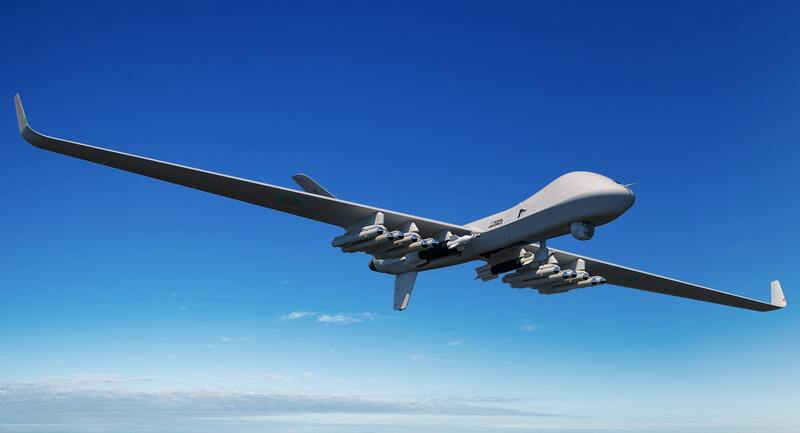 The missile has already successfully completed a series of trial firings on MQ-9 Reaper during early 2014 that saw the weapon engaging 70 mph/113 km/h and maneuvering targets with extreme precision from the RPAS; unmatched by any other weapon since. The missile promises to arm Protector with the ability to strike fast moving, maneuvering targets with both man in the loop post launch guidance and also autonomous post launch all weather capabilities. This confirms that the missile is a true multiplatform weapon that can operate across fast jets, RPAS and, most recently, helicopters. A number of further enhanced capabilities are planned to be developed and incorporated into the solutions for Protector, AH-64E and Typhoon, demonstrating MBDA’s commitment to spirally evolve the weapon to meet changing customer needs and adapting to new threats. The UK Sales & Business Development Director, James Allibone, highlighted the significance of the news saying, «Brimstone offers customers the ability to have one missile that can operate across their fleet of operational aircraft, whether they are jets, RPAS or helicopters. 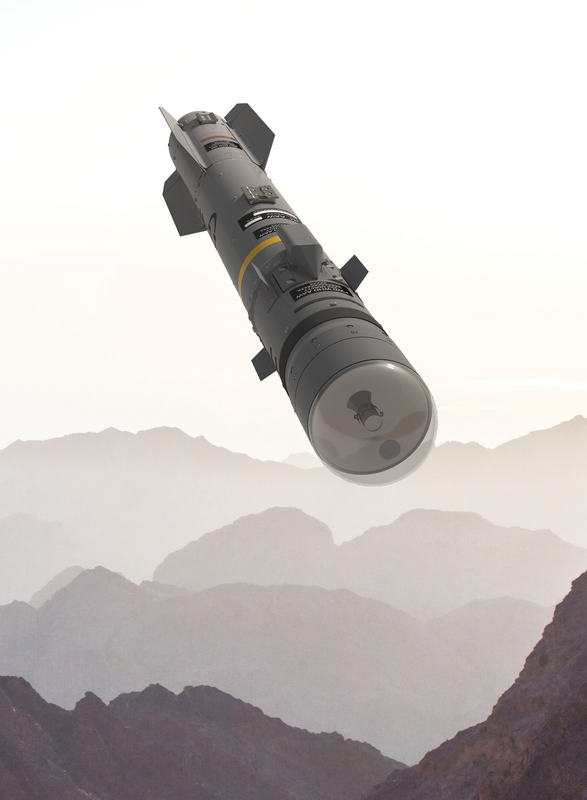 One missile for all platforms means customers benefit from simplified and more efficient training, logistics and inventory management as well as Brimstone’s outstanding precision against the most challenging of targets». The Brimstone air-to-surface missile developed by MBDA has successfully undertaken challenging operational evaluation trials by the Royal Air Force (RAF) that confirm the performance of the missile’s latest technical enhancements. This was achieved during February 2016 at China Lake in the USA as the culmination of a programme to advance the operational edge this highly capable missile brings. Brimstone has a record of approximately 500 missile firings with a very high success rate since its entry into service. The operational evaluation trials involved 11 missile firings, including at the edge of the weapon system’s performance envelope. The trials were conducted against a variety of operational scenarios with precise hits on very small, fast moving vehicles and against complex static targets. The trials included single and salvo firings, whilst laser, millimetric radar and dual mode guided modes were used, as was ground-based, third party laser designation. The trials demonstrated the missile engagement envelope is significantly increased over the in-service missile, providing a 100% increase in stand-off range (based on MBDA modelling and release ranges of the in-service missile), and a significantly increased ability to engage targets at high off-bore sight angles. This improves the ability to fire from a launch platform performing a Close Air Support (CAS) flying pattern («wheel») over the battlefield, without the need to manoeuvre the platform to align with the target. The firings also successfully demonstrated the new Insensitive Munition (IM) warhead, against armoured and non-armoured targets whilst bringing additional deployment benefits. The RAF’s Eurofighter Typhoon will benefit first from this enhanced capability, with an integration programme underway for 2018. Separate activities are being conducted for Brimstone’s potential use on the UK’s Future Attack Helicopter and Protector Remotely-Piloted Aircraft System (RPAS).